Now that I can walk again, here's my 3M Half Marathon Race Report that you've all been waiting for! First of all, the organizers of this race don't mess around. Pre-race communication via email and social media was stellar, packet pickup was easy breezy, the start and finish areas were magnificent, and the volunteers were amazing. 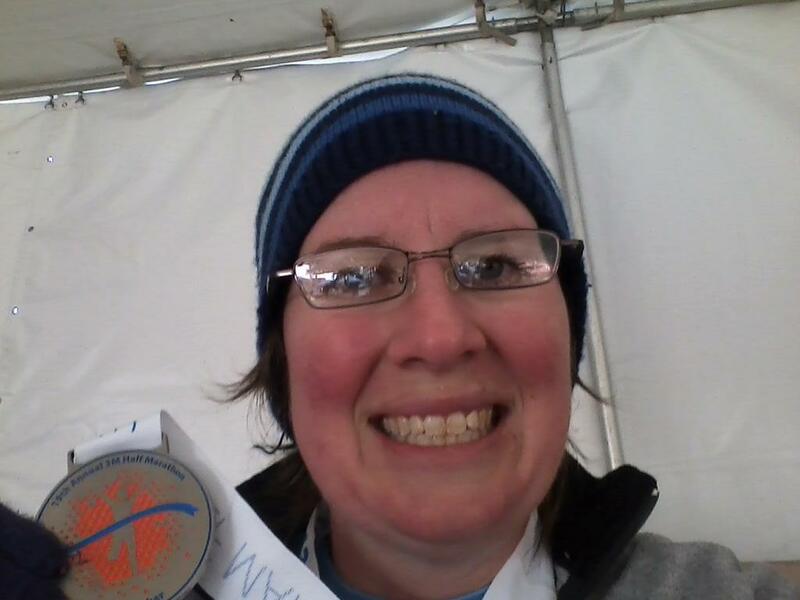 I will definitely be doing this race again, and if you're looking for a great January half marathon, look no further. The 3M is where it's at. So, it was cold Sunday morning. I didn't dare look at the temperature on race morning, but I know the forecast was for the high 30s, with a stiff breeze, which was supposed to bring us down to a feels-like of 30ish. I put on my normal running clothes and got some warm thrift-store finds to wear over them until I got warm enough to cast them off (discarded clothes are picked up off the course and donated afterward). At the beginning of the race, I was certain I would finish with my extra clothes on. I did eventually get rid of them, but it was pretty late in the game. And the sweats I was wearing on my lower half rubbed a gash in my side that I've been trying to heal up all week long. Everything was rolling along just fine, but I waited until after the 10K mark to take a walk break. I had decided: No more than one walk break per mile, and I could only walk for the length of one song on my iPod. So, that's what I did, and when I started running again my legs were a bit surprised. They stayed surprised for pretty much the rest of the race. 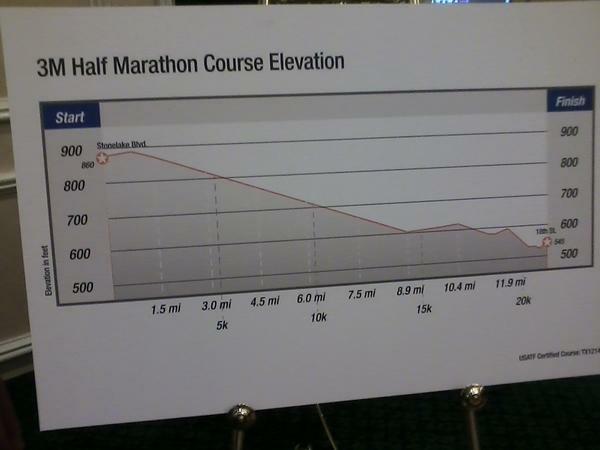 By mile 9, it hurt just as much to walk as it did to run. I still took planned walk breaks at miles 9 and 11, and up some really uncool hills on either side of mile 12, which were not planned but pretty much had to happen. Fortunately, "One Day More" came on my iPod at a critical moment when I was walking uphill, so I had to start running. Yep, one of my many running rules is "No walking during 'One Day More'". And really, how could I possibly? That's not a song you're meant to stroll along to. So, the final bit of the course went around UT campus and finished a couple of blocks behind the Capitol. I shuffled zoomed across the line and one of the fabulous volunteers put my medal on me. And seriously, wow. Normally they just hand one to me, and I'm totally okay with that, but the 3M obviously goes above and beyond. I collected my bag with a dry set of sweats, dry hat, and dry gloves, and changed into them all as best I could for my already-stiff muscles. I finished in just under three hours, which I expected, and Chadwick finished about 45 minutes behind me. We met up with our friend who we rode with (he finished 15 minutes before I did) and compared our aches on the way home. And that's the game! It was really fabulous to do another half after so long away from running any kind of distance, but I think it will be at least a year before I do it again. Right now, we're eyeing a 10K in April. I've done the long runs (slowly), the short runs (when I remembered), and the rest days (a lot!). 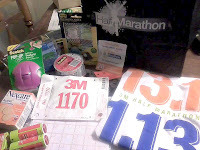 Yesterday I picked up my packet with my race number and a whole bunch of goodies. Also bought some throwaway clothes from a thrift store to start running in and toss to the side when (if!) I get hot. I'm ready. Contents of the goodie bag. 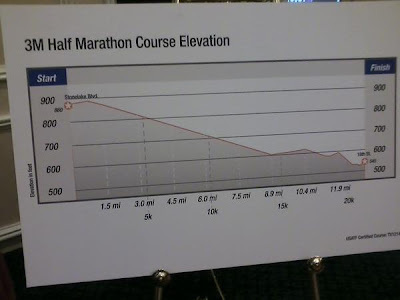 Yep, tomorrow morning I'm running the 3M Half Marathon-- my longest race since I ran the Austin Marathon three years ago. I can't believe how long it's been. Right now, I'm totally calm and happy, but tomorrow morning I should have plenty of butterflies for the race start. Since the last couple of years have been pretty uneven for me in the running realm, I'm hoping this race will re-ignite the love I had for running not so long ago. I've been liking it, even enjoying it most days, but loving it-- not so much. I'm not sure where I went wrong, although I suspect it was all the running I did for the marathon. I think I jumped into that one before I was really ready for it. And honestly, I probably run too slow to realistically train for a marathon well. It took up so much time and I felt like I didn't do anything but run for three months. I like the idea of doing another full marathon, but in practise... I don't know. Certainly not until after I finish grad school. Anyway, never mind that! The gun goes off at 6:45 tomorrow morning, so we'll be at the race start plenty early to freeze to death before we start going-- The Weather Channel says it will be 40° at 6 AM, with a 13 mph wind giving us a "feels like" of 32. The past two years in a row, it's been warm & gorgeous on 3M weekend and I've wished I were running. I should have known it would take my intervention to make it cold and blowy. And there's really nothing not to like about that. What are you doing this weekend? I hope you're getting more relaxing done than I am! One more week to go before the spring semester starts. Aaaarrrrrgh. I've really enjoyed this über-long break. This semester, I'm taking two classes (for those not keeping track at home, I'm an online grad student now, and take a lot fewer classes than I used to at UT) and still working the same number of hours. On the upside? No NaNoWriMo this semester, so I'll have more time available at the end of the semester. In the meantime, the Texas Legislature is about to get underway, and I couldn't be less excited about it. I work in advocacy, and we have some laws that we'd like to see passed, and that means I'll have to go to the Capitol a time or two and look intelligent. Gah! But there is yet another upside, and that is that I can spend most of the session writing things at my desk in our office, instead of talking to politicians. Anyway. So I've tried to be productive during my break-- our room has had a long-overdue clearout, including the closet and all the stacks of paper and junk that accumulate over time if you aren't paying attention. A couple bags of rubbish and a trip to the thrift store later, and we can now move around in our room. The final step is to get the furniture rearranged to suit us better. Oh, and we're shuffling crawling running a half marathon next Sunday. We're both so undertrained it should be illegal. And I'm headed back to work today after having two Mondays in a row off. I've forgotten what it's like to work a full week. Holidays will do that to you! My resolution post will have to wait until I settle on some resolutions. Which may not be until closer to the new semester starting, alas. Before my teaser, here's at least one book-related goal: I've set my 2013 Goodreads Challenge. One book per week this year, for a total of 52. This is less than the last two years (100 each), but I'm adding a new rule for myself: No re-reads this time; they have to be fresh books. However, I am still including textbooks if I read the entire thing. After all, textbooks are a big reason I don't do as much reading as I'd like. The twins remain perfectly pleased with the arrangement, receiving irregular lessons on innumerable subjects and reading every book they can get their hands on, piles of them often ending up in the wrought-iron cradle they would not part with after it was outgrown. 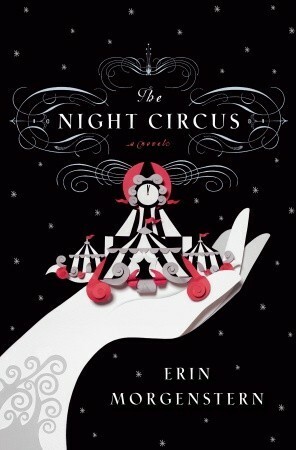 At this late hour there are no patrons lingering in this particular tent, and it is unlikely that any other visitors to the circus will stumble upon it in the remaining hours before dawn.